On Saturday, December 17, 2016, 12:30 - 4:30, we will be baking 1000 cookies from eight different recipes at our annual Holiday Cookie Baking Class. Join us for this 12th annual tradition and bring the children with you so they can make some "sugar plums" of their own. Free admission for one child under 12 with each adult. We will have a table where the kids will decorate their very own cookies to take home. Every one will go home with a plate of cookies that you and your friends have baked together along with recipes for baking at home. Yesterday, I had the very good fortune of meeting renowned cookbook author, Dorie Geenspan at a Melissa's Producecookie tasting and we will be baking two cookies from her newest book, Dorie's Cookies . 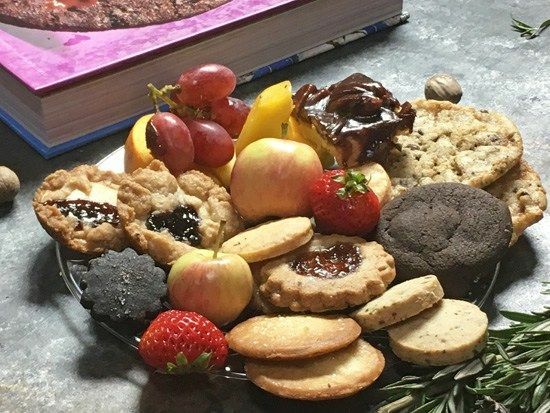 It was way too difficult to choose which cookies we will bake from the ones I tasted, but I think we will have a beautiful array of cookies on our plates that your guests will ooh and aah over. Here's the cookies that will be on your cookie plate this year when you attend the Holiday Cookie Class on December 17, 2016 at the Holy Nativity Community Hall. Classic Jammers - from Dorie's Cookies - baked in muffin tins! You don’t want to miss this class. So much fun! Bring your apron, cookie tin and the kids for an afternoon of baking and holidaying. Patricia K. Rose, of Fresh Food in a Flash will lead this hands-on cooking class on Saturday, December 17, 12:30 – 4:30 at the Holy Nativity Community Hall in Westchester. You will go home with a plate of cookies that you and your friends have baked together along with recipes for baking at home. Class fee $50 when you reserve by December 12 , $55 thereafter if space is available. One child under 12 can accompany an adult at no charge; second child under 12 half price. To reserve your spot, email [email protected] and you will receive a credit card invoice back. Classes take place at Holy Nativity Community Hall, 6700 West 83rd Street, Westchester, CA 90045.